SOUTHERN UTAH — A Santa Clara native, Tyler Utley and five other “Gran Turismo 6” gamers are now one giant step closer to becoming Nissan’s next professional race car driver. 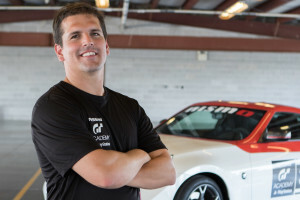 Utley beat out over 30,000 competitors in the 2015 “Nissan GT Academy” online competition to make it to the U.S. Finals in Nashville, where he competed against 20 finalists in the two-day competition. During the competition, the dedicated gamers took part in virtual races, fitness challenges, skill testing and on-track time trials in Nissan vehicles. Following two intense days of competition at the U.S. 2015 Nissan GT Academy Finals in Nashville, the six competitors earned the right to represent the United States during the “International Race Camp” at the legendary Silverstone Circuit in England, where the next GT academy champion will be crowned. The gamers include: Utley; Armen Agakhan from Glendale, California; Max King from Franklinville, New Jersey; JT Lauro from Seminole, Florida; Ryan Lynch from Broomfield, Colorado; and Vladimir Skirda from Hermantown, Minnesota. With the mid-summer sun shining and temperatures rising over 90 degrees, grueling fitness challenges late Wednesday morning included the “bleep test,” “planking challenge” and a pushup competition. Contestants then took a short break for lunch before competing in time trials on the track Wednesday afternoon at Nashville Motor Speedway. Virtual and skill challenges were completed Tuesday. By the end of the day Wednesday, these six finalists proved they had the on-track ability, strength, stamina, media prowess and more to earn the right to move on to the “International Race Camp” in August. Americans Agakhan, King, Lauro, Lynch, Skirda and Utley will now join an elite group of 30 GT Academy finalists from around the world. These global finalists – with six competitors each from the U.S., Mexico, Turkey, North Africa and Australia – will take part in a week-long race camp competition. Here, competitors will once again be tested on their strength, stamina, mental agility and on-track driving skills. Judges will look for pure talent, drive, passion, dedication and more to determine who will be the 2015 GT Academy Champion, Nissan’s next professional race car driver. The International Race Camp began Thursday and will conclude Wednesday. GT Academy is a collaboration between PlayStation and Nissan that uses the virtual world of the “Gran Turismo 6” game to unearth real-world racing talent. Now in its seventh year, GT Academy includes separate competitions for Europe (France, Italy, UK, Germany, Spain, Portugal, Belgium, Netherlands, Luxembourg, Hungary, Poland and Czech Republic), International group (Australia, Mexico, North Africa, Turkey and United States) and Asia (India, Thailand, Philippines, Indonesia and Japan). Previous winners of GT Academy are now regular racing drivers. In 2015, Jann Mardenborough (UK, winner in 2011) is racing in the “World Endurance Championship” for Nissan in the top LM P1 category and in GP3, a feeder series to “Formula One,” with the championship-winning Carlin team. Lucas Ordoñez (Spain, winner in 2008) will be racing in the “Le Mans 24 Hours” in 2015 in the Nisan GT-R LM NISMO LMP1 entry, alongside Mardenborough. The 2014 Champions, Gaetan Paletou (Europe) and Ricardo Sanchez (International) are competing in the “Blancpain Endurance Series” with the Nissan GT Academy Team RJN.